Four months since the upset election of Donald Trump over Hillary Clinton, one of the primary scapegoats of the Democrats for their stunning electoral failure remains the Green Party and its 2016 presidential nominee, Jill Stein. Pointing to final vote tallies in Pennsylvania, Wisconsin and Michigan that showed Trump’s margin of victory as being below the total vote count for Stein, Democrats have coalesced around the conventional wisdom that Stein voters flipped the election by failing to unite behind the Democratic nominee. The problem with this analysis is its flawed logic that anyone’s votes actually “belong” to anyone else, and further, it rests on the false assumption that all of Stein’s voters would have naturally voted for Clinton had the Green Party not been competing in the election. The fact is, many of these voters were turned off by Clinton’s hawkishness, perceived ethical lapses and close Wall Street ties, and would have never voted for her regardless of whether there was a third party alternative or not. Some would have stayed home, and others might have actually voted for Trump. Democratic Party operatives have spread salacious rumors suggesting that Stein is under Putin’s control, using a photo taken in late 2015 of Stein sitting at a table with the Russian leader as proof of possible disloyalty or perhaps even treason. 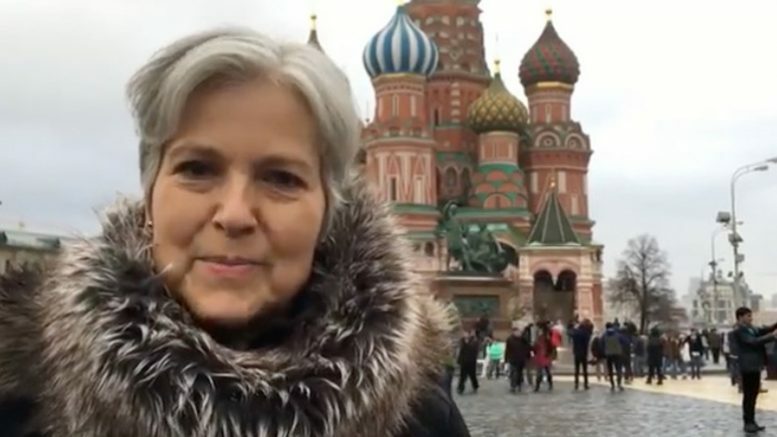 Viewed within the current context of the “new Cold War” and as part and parcel of the Russian election-meddling allegations, the photo of Stein is all the evidence needed by many Democrats predisposed to assume the worst about the Green Party and its nominee. “So everybody’s like, ‘Wow, how come this like super, super aggressive opposition that we saw from these third-party candidates – how come they haven’t said anything since this scandal has broken? '” Maddow said on Viceland’s Desus & Mero show on Feb. 15.